As we close out the first week of February, I’m writing to illustrate the types of great opportunities waiting for all of us. All the trades we share are based on our Momentum Reversal Method (MRM) trading system. There are two key components of this trading strategy; A. identifying recent price rotation, or B. identifying price resumption of existing momentum. Both examples, today, will focus on two unique examples of the Momentum Reversal Method and two unique setups. Today’s examples are XRT and AIQ, setups that we believe will result in tremendous opportunities for traders over the next 2-3 weeks. 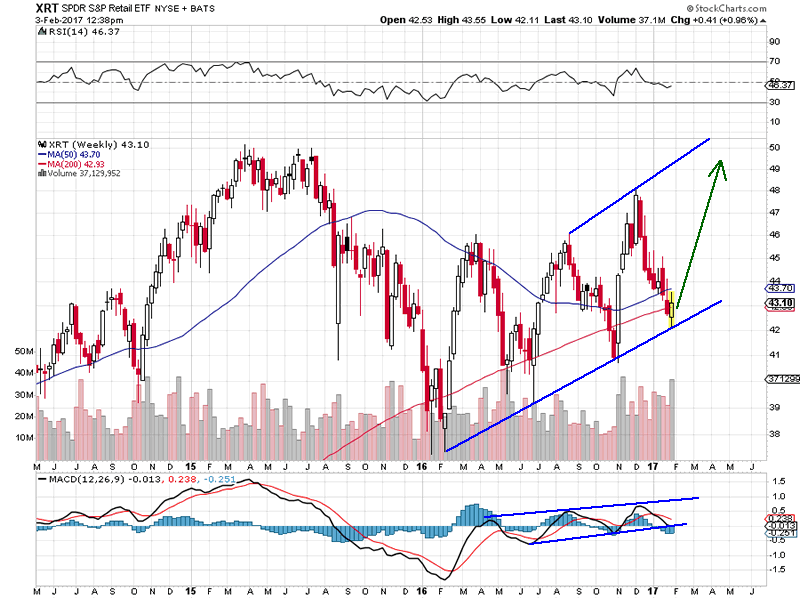 XRT, the SPDR S&P Retail ETF, is setting up perfectly for a Momentum Reversal Method BUY trigger. Historical trend has been established as Bullish and we are seeing clear rotational channels with defined support and resistance. We would initiate a BUY signal for XRT at (or near) $43.20 with a stop at $41.10. Our projected targets would be $45.00 & $48.25. 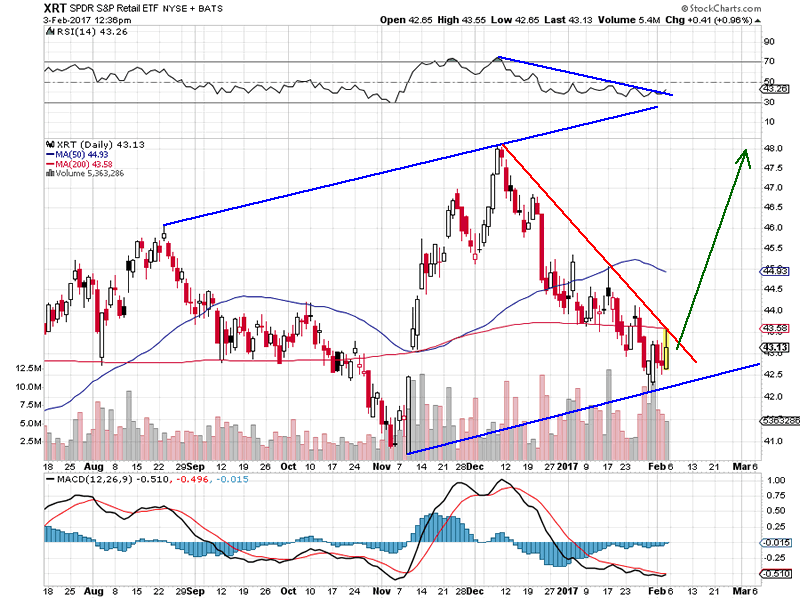 We expect XRT to breakout to the upside relatively quickly (possibly lasting less than a week total) and we expect this is a great opportunity for a quick 10%+ BUY trade. The unique aspect of this Momentum Reversal Method setup is the trending channel and price rotation. This established trend channel provides conformation that the current momentum is bullish and that this trade, near the lower channel, is a low risk entry with a high likelihood of success. Our targets are reasonably located within the existing range. All we need to do is wait for the breach of the current downward price trend and we will be watching this rally. 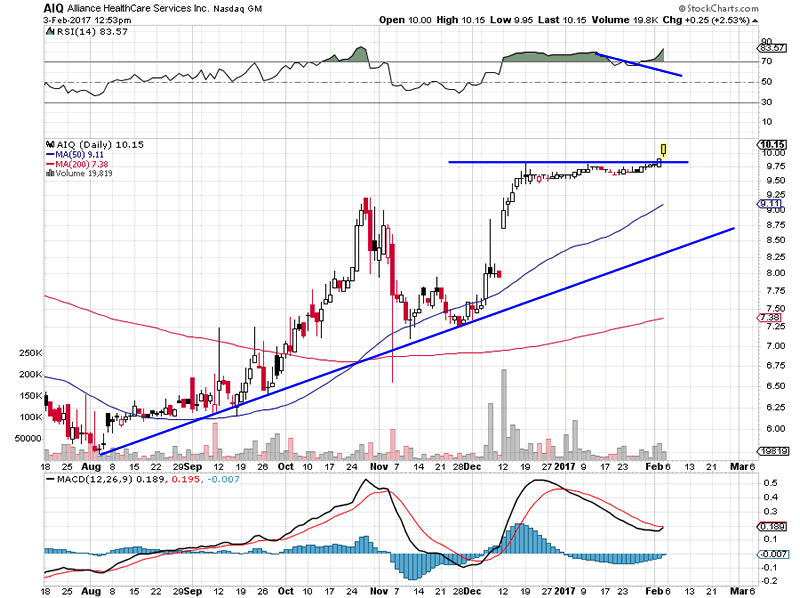 AIQ, Alliance Healthcare Services Inc, has been on our radar for about two months. Obviously, I don’t want to chase it for a buy trade. Our MRM method requires that we wait for the market price to show us the proper setup. In this case, the price reversal off the bottom was a good move, but did not meet our requirements for trade entry. The current congestion near $9.75 provided the confirmation we needed to make the call. This type of move, an upward Pennant formation after establishing a new high is typical of a pending breakout move. These types of “Momentum Resumption” trades can be explosive in nature and result in massive short term gains. 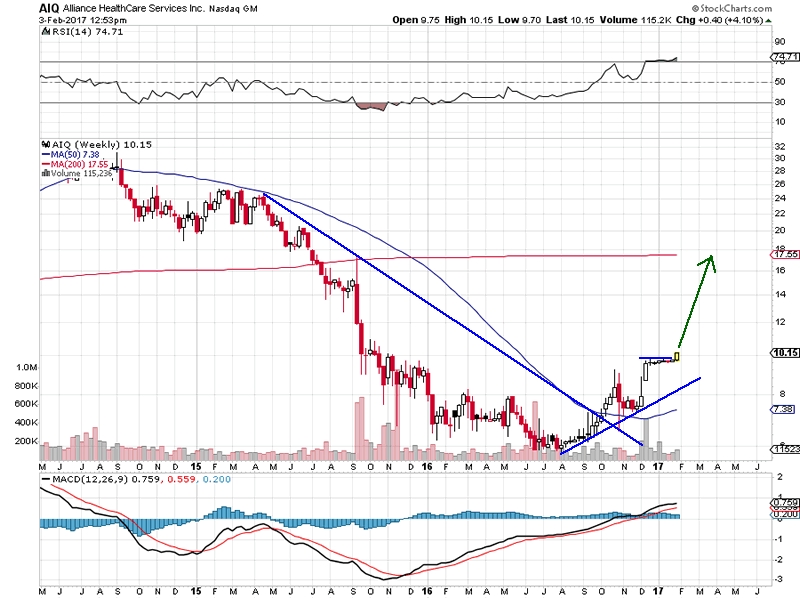 The breakout, today, shows this symbol is ready to run and our targets would be $12.50 & $14.50 (20% and 40% gains). As we’’ve stated before, we will not share our complete Momentum Reversal Method strategy with readers, but will share select components so that you can see how powerful this strategy is. Our recent NUGT trade is up over 88% currently and we are still expecting further gains. We welcome you to investigate the Momentum Reversal Method trading strategy by visiting ATP. These two “real signals” are our way of thanking you for your interest in our trading strategies and articles. The next few weeks should be all that is needed to see gains with these triggers. Feel free to visit www.ActiveTradingPartners.com to see how easy it is to profit from my analysis and to see how well the Momentum Reversal Method works in real-time. I sincerely hope you enjoyed this article and were able to see how you can improve your future trading successes by using some of these components.